This guide covers the use of exchanges according to the AMQP 0.9.1 specification, including broader topics related to message publishing, common usage scenarios and how to accomplish typical operations using Langohr. This work is licensed under a Creative Commons Attribution 3.0 Unported License (including images and stylesheets). The source is available on Github. What version of Langohr does this guide cover? This guide covers Langohr 3.6.x. An exchange accepts messages from a producer application and routes them to message queues. They can be thought of as the "mailboxes" of the AMQP world. Unlike some other messaging middleware products and protocols, in AMQP, messages are not published directly to queues. Messages are published to exchanges that route them to queue(s) using pre-arranged criteria called bindings. There are multiple exchange types in the AMQP 0.9.1 specification, each with its own routing semantics. Custom exchange types can be created to deal with sophisticated routing scenarios (e.g. routing based on geolocation data or edge cases) or just for convenience. A binding is an association between a queue and an exchange. A queue must be bound to at least one exchange in order to receive messages from publishers. Learn more about bindings in the Bindings guide. As stated previously, each exchange type has its own routing semantics and new exchange types can be added by extending brokers with plugins. Custom exchange types begin with "x-", much like custom HTTP headers, e.g. x-consistent-hash exchange or x-random exchange. Before we start looking at various exchange types and their routing semantics, we need to introduce message attributes. Every AMQP message has a number of attributes. Some attributes are important and used very often, others are rarely used. AMQP message attributes are metadata and are similar in purpose to HTTP request and response headers. Every AMQP 0.9.1 message has an attribute called routing key. The routing key is an "address" that the exchange may use to decide how to route the message . This is similar to, but more generic than, a URL in HTTP. 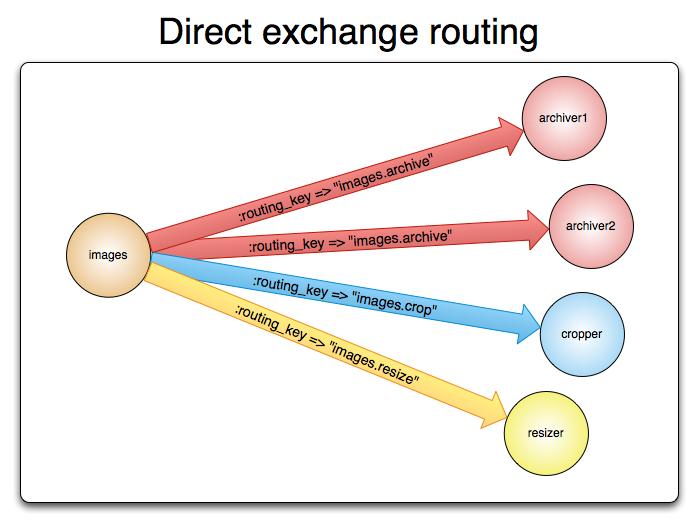 Most exchange types use the routing key to implement routing logic, but some ignore it and use other criteria (e.g. message content). A fanout exchange routes messages to all of the queues that are bound to it and the routing key is ignored. If N queues are bound to a fanout exchange, when a new message is published to that exchange a copy of the message is delivered to all N queues. Fanout exchanges are ideal for the broadcast routing of messages. "Starts a consumer in a separate thread"
(println (format "[consumer] %s received a message: %s"
Each of the queues bound to the exchange receives a copy of the message. AMQP 0.9.1 brokers must implement a fanout exchange type and pre-declare one instance with the name of "amq.fanout". Applications can rely on that exchange always being available to them. Each vhost has a separate instance of that exchange, it is not shared across vhosts for obvious reasons. A direct exchange delivers messages to queues based on a message routing key, an attribute that every AMQP v0.9.1 message contains. A direct exchange is ideal for the unicast routing of messages (although they can be used for multicast routing as well). The routing key will then be compared for equality with routing keys on bindings, and consumers that subscribed with the same routing key each get a copy of the message. 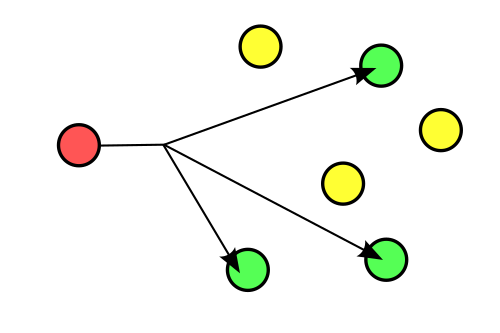 Direct exchanges are often used to distribute tasks between multiple workers (instances of the same application) in a round robin manner. When doing so, it is important to understand that, in AMQP 0.9.1, messages are load balanced between consumers and not between queues. The Queues and Consumers guide provide more information on this subject. Applications can rely on those exchanges always being available to them. Each vhost has separate instances of those exchanges, they are not shared across vhosts for obvious reasons. The default exchange is a direct exchange with no name (the Langohr refers to it using an empty string) pre-declared by the broker. It has one special property that makes it very useful for simple applications, namely that every queue is automatically bound to it with a routing key which is the same as the queue name. For example, when you declare a queue with the name of "search.indexing.online", the AMQP broker will bind it to the default exchange using "search.indexing.online" as the routing key. Therefore a message published to the default exchange with routing key = "search.indexing.online" will be routed to the queue "search.indexing.online". In other words, the default exchange makes it seem like it is possible to deliver messages directly to queues, even though that is not technically what is happening. (println (format "[consumer] Received a message: %s, delivery tag: %d, content type: %s, type: %s"
Topic exchanges route messages to one or many queues based on matching between a message routing key and the pattern that was used to bind a queue to an exchange. The topic exchange type is often used to implement various publish/subscribe pattern variations. Topic exchanges are commonly used for the multicast routing of messages. 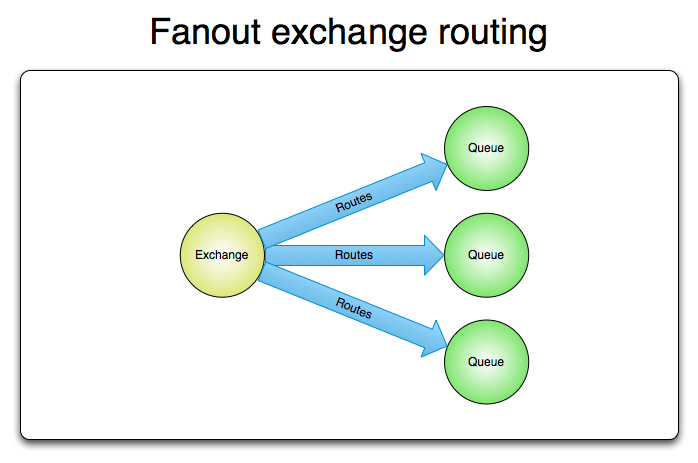 Topic exchanges can be used for broadcast routing, but fanout exchanges are usually more efficient for this use case. In the example above we bind a queue with the name of "americas.south" to the topic exchange declared earlier using the langohr.queue/bind function. This means that only messages with a routing key matching "americas.south.#" will be routed to the "americas.south" queue. In other words, the "#" part of the pattern matches 0 or more words. As you can see, the "*" part of the pattern matches 1 word only. "Starts a consumer bound to the given topic exchange in a separate thread"
The previous sections on specific exchange types (direct, fanout, headers, etc.) provide plenty of examples of how these methods can be used. The function accepts a channel, an exchange, a routing key (can be an empty string but not nil), a body and a map of message and delivery metadata options. The body can be either a byte array or a string. The message payload is completely opaque to the library and is not modified in any way. You are encouraged to take care of data serialization before publishing (i.e. by using JSON, Thrift, Protocol Buffers or some other serialization library). Note that because AMQP is a binary protocol, text formats like JSON largely lose their advantage of being easy to inspect as data travels across the network, so if bandwidth efficiency is important, consider using MessagePack or Protocol Buffers. All other attributes can be added to a headers table (in Clojure, a map) that langohr.basic/publish accepts as the :headers option. (lb/publish ch default-exchange-name qname "Hello!" Used for routing messages depending on the exchange type and configuration. When set to true, AMQP broker will persist message to disk. This flag tells the server how to react if the message cannot be routed to a queue. If this flag is set to true, the server will return an unroutable message to the producer with a basic.return AMQP method. If this flag is set to false, the server silently drops the message. MIME content type of message payload. Has the same purpose/semantics as HTTP Content-Type header. MIME content encoding of message payload. Has the same purpose/semantics as HTTP Content-Encoding header. Message priority, from 0 to 9. Message identifier as a string. If applications need to identify messages, it is recommended that they use this attribute instead of putting it into the message payload. Commonly used to name a reply queue (or any other identifier that helps a consumer application to direct its response). Applications are encouraged to use this attribute instead of putting this information into the message payload. ID of the message that this message is a reply to. Applications are encouraged to use this attribute instead of putting this information into the message payload. Message type as a string. Recommended to be used by applications instead of including this information into the message payload. Sender's identifier. Note that RabbitMQ will check that the [value of this attribute is the same as username AMQP connection was authenticated with](http://www.rabbitmq.com/extensions.html#validated-user-id), it SHOULD NOT be used to transfer, for example, other application user ids or be used as a basis for some kind of Single Sign-On solution. Application identifier string, for example, "eventoverse" or "webcrawler"
A map of any additional attributes that the application needs. Nested hashes are supported. Keys must be strings. It is recommended that application authors use well-known message attributes when applicable instead of relying on custom headers or placing information in the message body. For example, if your application messages have priority, publishing timestamp, type and content type, you should use the respective AMQP message attributes instead of reinventing the wheel. In some scenarios it is useful for consumers to be able to know the identity of the user who published a message. RabbitMQ implements a feature known as validated User ID. If this property is set by a publisher, its value must be the same as the name of the user used to open the connection. If the user-id property is not set, the publisher's identity is not validated and remains private. A commonly asked question about RabbitMQ clients is "how to execute a piece of code after a message is received". As you can see, "when data is sent" is a complicated issue and while methods to flush buffers exist, flushing buffers does not guarantee that the data was received by the broker because it might have crashed while data was travelling down the wire. The only way to reliably know whether data was received by the broker or a peer application is to use message acknowledgements. This is how TCP works and this approach is proven to work at enormous scale of the modern Internet. AMQP (the protocol) fully embraces this fact and Langohr follows. A more detailed overview of the pros and cons of each option can be found in a blog post that introduces Publisher Confirms extension by the RabbitMQ team. The next sections of this guide will describe how the features above can be used with Langohr. When publishing messages, it is possible to use the :mandatory option to publish a message as "mandatory". When a mandatory message cannot be routed to any queue (for example, there are no bindings or none of the bindings match), the message is returned to the producer. A returned message handler has access to the AMQP method (basic.return) information, message metadata and payload (as a byte array). The metadata and message body are returned without modifications so that the application can store the message for later redelivery. Messages potentially spend some time in the queues to which they were routed before they are consumed. During this period of time, the broker may crash or experience a restart. To survive it, messages must be persisted to disk. This has a negative effect on performance, especially with network attached storage like NAS devices and Amazon EBS. AMQP 0.9.1 lets applications trade off performance for durability, or vice versa, on a message-by-message basis. Note that in order to survive a broker crash, both the message and the queue that it was routed to must be persistent/durable. Durability and Message Persistence provides more information on the subject. When using Langohr in multi-threaded environments, the rule of thumb is: avoid sharing channels across threads. In other words, publishers in your application that publish from separate threads should use their own channels. The same is a good idea for consumers. Now that message attributes and publishing have been introduced, it is time to take a look at one more core exchange type in AMQP 0.9.1. It is called the headers exchange type and is quite powerful. The best way to explain headers-based routing is with an example. Imagine a distributed continuous integration system that distributes builds across multiple machines with different hardware architectures (x86, IA-64, AMD64, ARM family and so on) and operating systems. It strives to provide a way for a community to contribute machines to run tests on and a nice build matrix like the one WebKit uses. One key problem such systems face is build distribution. It would be nice if a messaging broker could figure out which machine has which OS, architecture or combination of the two and route build request messages accordingly. A headers exchange is designed to help in situations like this by routing on multiple attributes that are more easily expressed as message metadata attributes (headers) rather than a routing key string. It is possible to bind a queue to a headers exchange using more than one header for matching. In this case, the broker needs one more piece of information from the application developer, namely, should it consider messages with any of the headers matching, or all of them? This is what the "x-match" binding argument is for. When the "x-match" argument is set to "any", just one matching header value is sufficient. So in the example above, any message with a "cores" header value equal to 8 will be considered matching. When there is just one queue bound to a headers exchange, messages are routed to it if any or all of the message headers match those specified upon binding. Whether it is "any header" or "all of them" depends on the "x-match" header value. In the case of multiple queues, a headers exchange will deliver a copy of a message to each queue, just like direct exchanges do. Distribution rules between consumers on a particular queue are the same as for a direct exchange. Headers exchanges can be looked upon as "direct exchanges on steroids" and because they route based on header values, they can be used as direct exchanges where the routing key does not have to be a string; it could be an integer or a hash (dictionary) for example. Distributed build/continuous integration systems can distribute builds based on multiple parameters (OS, CPU architecture, availability of a particular package). AMQP 0.9.1 brokers should implement a headers exchange type and pre-declare one instance with the name of "amq.match". RabbitMQ also pre-declares one instance with the name of "amq.headers". Applications can rely on that exchange always being available to them. Each vhost has a separate instance of those exchanges and they are not shared across vhosts for obvious reasons. The x-random AMQP exchange type is a custom exchange type developed as a RabbitMQ plugin by Jon Brisbin. It is basically a direct exchange, with the exception that, instead of each consumer bound to that exchange with the same routing key getting a copy of the message, the exchange type randomly selects a queue to route to. This plugin is licensed under Mozilla Public License 1.1, same as RabbitMQ. Consumer applications (applications that receive and process messages) may occasionally fail to process individual messages, or might just crash. Additionally, network issues might be experienced. This raises a question - "when should the AMQP broker remove messages from queues?" This topic is covered in depth in the Queues guide, including prefetching and examples. We have two network segments, S1 and S2. Each of them may fail. P is concerned with making sure that messages cross S1, while the broker (B) and C are concerned with ensuring that messages cross S2 and are only removed from the queue when they are processed successfully. Message acknowledgements cover reliable delivery over S2 as well as successful processing. For S1, P has to use transactions (a heavyweight solution) or the more lightweight Publisher Confirms, a RabbitMQ-specific extension. Queues are bound to exchanges using langohr.queue/bind. This topic is described in detail in the Queues guide. Queues are unbound from exchanges using langohr.queue/unbind. This topic is described in detail in the Queues guide. Publishers publish messages to exchanges. Messages are then routed to queues according to rules called bindings that applications define. There are 4 built-in exchange types in RabbitMQ and it is possible to create custom types. Messages have a set of standard properties (e.g. type, content type) and can carry an arbitrary map of headers. The documentation is organized as a number of guides, covering various topics.